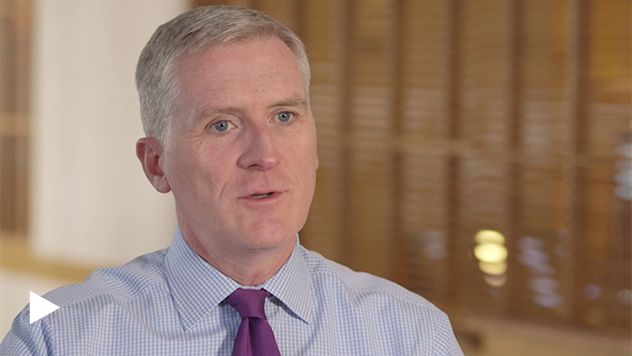 Co-CIO Francis Gannon explains what investors should know about the state of small-caps. What should investors know about the current small-cap cycle? In the small-cap space, we've had two distinct cycles since the market bottomed in March of 2009, one occurring in 2011 into '12, and the most recent in February of 2016, where we had just completed a 26 percent bear market. And I think that's significant in kind of resetting where we are in the overall market from a small-cap perspective. We are in a new small-cap cycle. It might be hard to believe if you're a large-cap investor, but in small-caps we are in the cusp of what we think is an elongated cycle within small-caps where we will see value outperform. The shift in the market that took place from the peak in June of 2015 to the bottom of the bear market in February of 2016 was really this rotation from growth to value. And we think that will continue to have legs for many years to come. What's next for volatility in the small-cap space? One of the hallmarks of this particular cycle that we've seen within the market has been very little volatility, very low volatility as measured by the volatility index or the VIX. I think one of the things we expect to see going forward is increased volatility. You've had these very volatile moments in the market around Brexit or the election in 2016, but in general, volatility has been quite low and sustainably low for a period of time. We think that's going to change. Part of this normalization of the rate environment is going to be almost a lessening of the importance of monetary policy. You're going to see the importance of fiscal policy come into play possibly over the next several years through infrastructure spending or possible tax cuts for corporate America, which we think could be significant, especially for small-cap businesses. But I think all of this will lead to a more normal environment, an environment where you will see an increase in volatility in the market, which we think has quite large benefits for active managers. What changed in 2016 and do you think it will last? I think one of the most important shifts in the market that investors aren't recognizing is the fact that we have seen this dramatic shift in small-caps away from growth back to value. The other thing I think, as you think about that, and I think most people are focusing on the performance of small-caps really since the election. But I think one of the things to understand is this shift that we're talking about from growth to value, and the shift to small-caps actually occurred prior to the election and is a trend that's been in place now for almost a year, I would say in the overall market and I think it's significant. Value has underperformed for a significant period of time, outside of 2016, where it did roar back quite successfully in the overall market. That being said, what we saw in the first quarter was a complete unwinding of what really worked in the fourth quarter in the full year of 2016. Growth led, non-earners came back and led quite successfully in the overall market. We don't think that's sustainable and part of the reason why we don't think that is sustainable is the fact that you are going to a more normalized environment from a rate perspective and the leg up that many non-earning companies had in the overall market has really been pulled away from them. So, we think you're going to see fundamentals continue to be important, which is kind of an odd statement to actually have to say, but fundamentals actually matter again and that will benefit a lot of value companies. And the value side of the market we think has a very long runway. The CBOE S&P 500 Volatility Index (VIX) measures market expectations of near-term volatility conveyed by S&P 500 stock index option prices. The performance of an index does not represent exactly any particular investment, as you cannot invest directly in an index.